Why Dickinson Cattle Co. LLC Beef? What is Dickinson Cattle Co. LLC ( DCC ) Beef? It is pure Texas Longhorn lean beef raised in the Appalachian foothills of south eastern Ohio. Why is DCC Beef better than Certified Angus? It is genetically leaner with less waste fat. It is all naturally grown without hormones, steroids, implants or laced with antibiotics of any kind. Longhorns marble excellent with a thin amount of waste back fat. In the world famous National Western Denver Stock Show carcass contest, a high percentage Texas Longhorn was judged the highest indexing prime entry for two years--superior to every other breed. Where are DCC cattle processed? Every beef is professionally vacuum-packed at USDA or ODA 100% inspected facilities. All meat handlers are legal citizens of the USA. Is Longhorn meat tough? Meat tenderness comes from cell multiplication. Healthy cattle multiply meat cells from one, to two, to four, to eight, etc. That is how tenderness is created. Healthy, nutritious, comfortable management creates tender enjoyable eating experiences. DCC Longhorn is tender. Are DCC cattle fed byproducts? The DCC cattle herd enjoy lush legume pastures with mineral spring water. When grass is covered by snow, hay is provided .During summer months contented cows sleep over 60% of the time in deep Ohio River valley grasses. No animal byproducts are fed at anytime. Who owns DCC beef? DCC beef is marketed by Longhorns Head To Tail LLC. Every critter is owned from conception to vacu-wrap by DCC . Every package of beef has an ancestry in the Dickinson families ownership up to eight generations. Who owns the generic beef in normal grocery stores? Statistics reveal the American consumer is the eighth owner. Cattle are bought, sold, hauled, medicated, fed and moved all over the nation before consumption. The average steer is hauled over 3000 miles during his less than 24 month career. Do DCC cattle receive a balanced diet? Bill Uckele of Uckele Health & Nutrition, Blissfield, Michigan, has tested every DCC water tributary, hay field and grazing pasture for mineral balance. A special mineral was formulated exactly for DCC to add any vitamin or mineral necessary for a perfect balanced cattle diet. 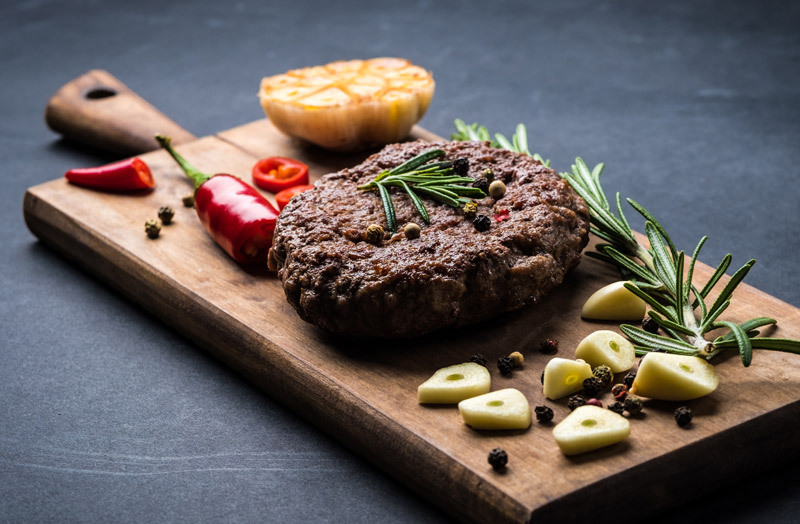 What is the shelf life of DCC meat products? All beef halves and value cuts are vacuum-packed to prevent freezer burn. This provides the longest possible fresh taste. It is fast frozen. Beef strips (jerky), cooked and smoked products have no extended shelf life preservatives. Due to the company policy of "all natural", our prepared products should be frozen or refrigerated until devoured. (Jerky can not hang in a truck stop un refrigerated for a year without major added "preservatives".) DCC jerky has a wonderful natural non-preservative taste like the1880 trail drive recipe. What is the best beef buy? It is always grind, (hamburger containing no ham). The grind has no waste bone, does not require a tenderizer, is 100% eatable, maybe savored by the filthy rich or panhandlers everywhere, can be enjoyed with dentures or without. It always sells reasonably priced especially for the nutrition it possesses. What part of a steer is made into grind? The DCC grass fed, range raised, all natural grind comes from the total body muscle. It includes all roasts,fillets, steaks, brisket, sirloin, chuck, etc. It is not a scrap meat product. It is the whole steer. There is a noticeable difference. Is all DCC beef totally grass fed? No. Some select steers are fed our natural "Tasty Lean" finishing ration for 90 to 100 days. This is done mostly in winter when grass is dormant. Gourmet beef aficionados may purchase the 100%grass fed grind or grass grown beef with the "Tasty Lean" finishing ration. Does DCC provide freezer beef? Yes. Beef halves may be ordered in advance and may be cut to special preference. Bulk beef purchases are economical, healthy and delicious. Does the age at processing effect beef taste? Yes, very much so. "Bob veal" are calves slaughtered at less that a month of age. The meat is very tender,normally a lighter pink shade with a bland taste. Regular veal calves,mostly milk fed, are less bland in taste and about seven to nine months old when processed. The majority of USA beef steers are feedlot fed and processed at age 13 to 18 months. DCC fed beef is grass fed until about 800 pounds then grain finished and processed at 20 to 24months of age. The extra grass time and maturity creates an old fashioned taste just the opposite of a veal product. Extra grass time is the secret taste formula. Neither fine wine or fine beef can be rushed to perfection. Is grass fed, all natural beef easily available? No. Statistics show less that 4% of the USA beef supply is proven all natural and grass grown. The country and location of origin are unknown by the consumer and unidentifiable inmost beef cases. Does the breed of cattle effect meat quality? Texas Longhorn cattle are disease resistant,healthy and without a doubt possessing more longevity than any other USA breed. You are not only "what you eat", but "what you eat--eats." What is a "celebration food"? When a great event is consummated and a celebration meal misappropriate, do we suggest an oriental buffet, Mexican food, roasted chicken, turkey hind quarters or cole slaw entree? No, never!It's "...Let's go eat a steak!" What part of beef helps prevent cancer? Grass fed beef is high in "Conjugated Linoleic Acid" or CLA. Noted Doctor Michael Pariza, University of Wisconsin,discovered that CLA interfered with growth of cancer tumors. The University Francois-Rabelais, France (Lavillonniere) revealed when breast adipose tissue was collected that CLA has a protective effect against breast cancer. CLA can not be produced by the human body, but is easily obtained through foods such as whole milk and beef from grass fed cattle. Grass grazed cattle had five times more CLA than those fed corn silage. What kind of beef helps prevent heart attack? Cattle produced completely on a grass diet,have revealed up to five times more "Omega-3" fatty acid than non-grass fed. By regular intake of grass fed beef within a few months one can alter the type of fats found in all our cell membranes as well as their function. The scientific benefits of increasing Omega-3 fatty acids into the cellular membranes of the heart muscle cells as well as the endothelium of the arteries is profound. This will modify cell signaling and gene expression as well as promote the production of beneficial prostaglandin's while reducing harmful clot-promoting thromboxanes. Coronary thrombosis/heart attack is prevented and electrical stability created reducing arrhythmia. What about vitamin E? Grass has 20 times more vitamin E than corn. Meat from cattle raised on lush grass is four times higher in vitamin E than feed lot cattle.In humans, vitamin E is linked with lower risk of heart disease and cancer. This potent antioxidant may also have anti-aging properties. Most people are deficient in vitamin E.
Should families be concerned about antibiotic feeding to food animals? According to Reuters News Service last year, three million pounds of antibiotics were given to humans. Animals (fowl included) received 25.6 million pounds. About 24.6 million pounds of medication went for meat production to healthy subjects. The Union of Concerned Scientists seriously fear the human population is becoming resistant to historically helpful antibiotics by intake of meats grown with heavy use of antibiotics. Which food animals or fowl utilize the most antibiotic? Many of the largest poultry, turkey and pork producers daily lace water and feed with antibiotic to prevent sickness. The smaller meat animals use more medication per pound than the larger. Which food animals, fowl or fish use the least antibiotic? Free range, grass fed DCC Longhorn beef is raised free of antibiotic feeding, hormone, steroid or growth implants. It is the way Longhorns were raised when they walked the pristine trails of 1880. Request 100% grass fed Longhorn beef and know for sure you are doing the right thing for your family, for all the right reasons. Thank you for scientific research: Jo Robinson, Kent State University,University of Memphis, University of Wisconsin, USDA Western Human Research Center, Medstat Research Ltd. in Norway, Uppsala University in Sweden, University of Kumanoto in Japan, University of Tour in France, Dr. Michael Pariza, Dr. David Kritchevsky, Dr. Patricia Whisnant, Sally Fallon, Dr. Tilak Dhiman, Utah State University, Dr. Joseph Graham, and Dr. Rolland Vernon.